Remember that scanning from a commercially printed item may infringe on the copyright of that item. Check with the author or creator to receive the proper permission before using any copyrighted material in your work. • Purposefully place the image on the scanner in a crooked manner. • Within your scanning software, capture the image at a significantly higher resolution than you plan to use it. In most cases, this will mean scanning the image at approximately 1200 dpi, or however high your scanner is able to scan. The process of rotating the crooked image and reducing its size will cause the dots to blur and thereby lessen the effect of the halftone screen. After you scan the image, follow the steps in the preceding tip ("Straighten a Crookedly Scanned Image") to straighten and crop the scan. Then, choose Image I Image Size and reduce the size of the image to be the size at which you intend to use it. Performing these two things—straightening and downsampling an image—does a lot to increase the image's clarity, but there's still a bit more you can do. 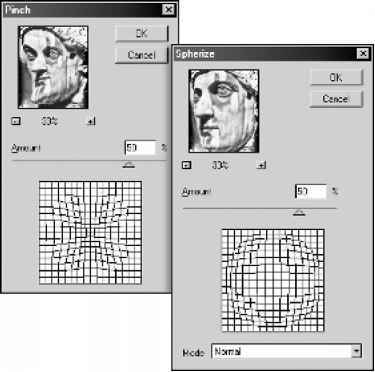 To further reduce the effect of the halftone screen on a scanned image, apply a few filters on one or two channels in the image. First, choose Window I Channels to view the Channels palette. Click each of the channels to determine which one contains the majority of the dot grain from that halftone pattern. Then, try applying a Gaussian Blur, with a Radius value of between 1 and 4 (depending on the size of your image) just on the contents of that channel—leave the other two channels untouched to hold the detail of the image. Another filter that works quite well—if not better in some cases—is the Median filter, because it seeks to remove all noise in an image. Just as with the Gaussian Blur filter, try applying the Median filter (choose Filter I Noise I Median) on the channel that contains the most contrast in the dot grain. If necessary, the filter can also be run on another channel, as long as there is one channel left untouched to retain the image clarity.